Senior Lifeguard Janusz Burda swam to help the middle-aged man who had been swept 350 metres offshore while ‘under the influence of alcohol’. 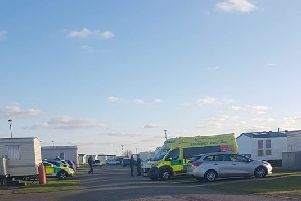 Speaking to the Standard, Janusz said: “The man was spotted around 1,000 metres away from the lifeguarded area and I could see he was rapidly being pushed out to sea by the wind. “I quickly put on my wetsuit and swam out to him. Once I got close he must have heard me splashing as he woke up. He said to me ‘am I in trouble now?’ and I said ‘no, you’re being rescued now’. The 20 year-old lifeguard had the task of swimming back to dry land with the man and his dinghy - made all the more arduous by the tide and wind which had pushed the pair a further 500 metres out. Lifeguard Janusz Burda, left, pictured during a training session. Photo: RNLI. The lifeguards had called for back-up from the Lifeboat and Coastguard but Janusz managed to reach the shore before they arrived, a mile away from their unit. Fellow lifeguard George Walker was also on his way in the paddle boat. “It was scary, but in this situation I knew I had the support of the other Lifeguards and that the Lifeboat and Coastguard were on their way to back me up,” added Janusz. This is just one of many rescues that lifeguards at Ingoldmells and Skegness have responded to in the last few days. On Friday, July 20, Janusz helped to save an unconscious boy from the sea at Ingoldmells, while colleagues Arun Gray and Courtney Fear helped in the rescue of six children there the following Monday. We also reported how newly-recruited lifeguard Jake Hamilton pulled a six year-old girl from the sea at Skegness after she had drifted into deep water last week. Speaking about yesterday’s rescue, Lifeguard supervisor Arun Gray added: “We put an orange windsock up above the lifeguard station reminding people not to use inflatables in the water when the wind is going out to sea, so it’s important that people take notice of this. With another heatwave forecast from tomorrow - the RNLI is again warning beachgoers about the dangers of the sea. From strong currents that upfoot swimmers, winds that gradually push inflatables out to sea, and tides cutting people off - the dangers of swimming in UK seas are again being highlighted following incidents at Ingoldmells and Skegness. Beachgoers are advised to pick a lifeguarded beach and only swim between the yellow and red flags they put out each day. An RNLI spokesman said: “Despite it being early stages of the summer for a lot of beachgoers, lifeguards have had a busy start to the season providing assistance and vital rescue services. If you’re caught in a rip current, the RNLI’s advice is to stay calm and float on your back to regulate your breathing until you can swim to shore or call for help. Keep hold of your board or inflatable and raise your hand and shout for help. Never try to swim directly against the rip or you’ll get exhausted, and swim parallel to the beach until free of the rip, then make for shore.